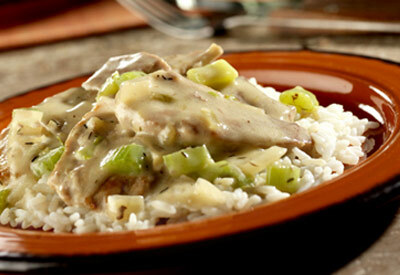 Strips of pork loin, celery and onion are coated in a creamy sauce and served over a bed of rice for this satisfying family supper that's ready in just 35 minutes. Heat 1 tablespoon oil in a 10- inch skillet over medium-high heat. Add the pork and cook until well browned, stirring often. Remove the pork from the skillet. Heat the remaining oil over medium heat. Add the celery, onion and thyme and cook until the vegetables are tender, stirring often. Stir the soup and water in the skillet and heat to a boil. Return the pork to the skillet and cook until the pork is cooked through. Serve the pork mixture over the rice.